A bass this size will really push the Nissin Air Stage 240. The Nissin Air Stage 240, a Gold-Ribbed Hare's Ear Nymph, and a Micro Bass. The temperature has been pushing 80 degrees the past few days in San Antonio, which means that the stocker rainbows are playing out and the warm-water fish are stirring. On my day off, I decided to visit a nearby urban creek to try my luck. The morning turned out to be one of those special outings where every other cast triggered a strike. 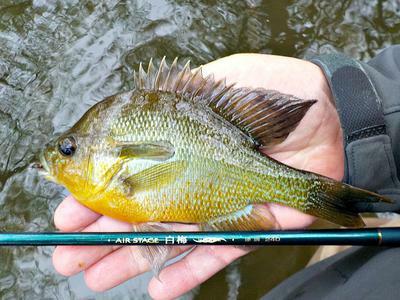 My rod of choice was the ultralight Nissin Air Stage 240 equipped with a standard Gold Ribbed Hare’s Ear Nymph. The fish wouldn’t stop, and by lunchtime, I’d had about all the fun I could stand. Trips such as these make up for those other excursions where the fish just won’t cooperate. Springtime in Texas is a fine time to be tenkara angling. I was able to use the same nymph all morning long; but, by the time I headed to the truck, it was just a bit of rabbit fuzz and tinsel on a hook. Who says that flies have to be pretty to work? 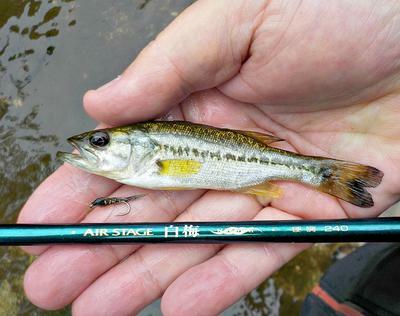 I’ve said it before: If you enjoy pursuing small fish on skinny water—or you enjoy micro fishing at all—you have to consider the 240 Air Stage. For its intended purpose, Nissin really nailed its design and execution. A bass the size of the one in the second photo will really put a deep bend in the rod. You’ll feel every twitch, head shake, and hook-up. Are the fish stirring in your local waters? If so, get to it! Spring only lasts so long. I always look forward to your posts. Thank you for being so generous and sharing your stories. I too own the Hakubai 240 (medium). I would enjoy comparing notes. What line setup do you commonly fish with your 240? Thanks! Thank you for the encouraging words. I'm a little bit of an oddball on line set-up because I use high-quality furled lines with 2 feet of 7X tippet on the end. Most tenkara anglers nowadays use level lines, but I just enjoy the way furled lines look and cast. The furled line I'm using right now is made of chartreuse and black threads, and I usually treat the line with Otter Butter. I keep the total line length about the length of the pole. For flies on the 240 I use Utah Killer Bugs, lightly weighted, Hare's Ear Nymphs, some midges, or an Elk Hair Caddis if fishing dry flies. When I'm fishing the Air Stage, it's usually in tight quarters, so I use a bow-and-arrow, or slingshot cast, about half the time. Thank you for sharing your set up. Interesting to hear about your use of furled lines. Currently, I have a mainline that is the length of the rod composed of clear 2X tippet down to a short section of white sighter down to a tippet ring. I add a few feet of tippet from there. I usually fish a size 20 white killer bugger or a size 16 black killer bugger. Thanks for the report. I was born and raised in SA, but wasn’t aware of tankara then. I’ve done some light-tackle fly fishing on the Guadalupe and Medina though (as well as Lake Austin), and that was a blast. Wish I was in SA fishing! The Texas Hill Country rivers and streams work well for tenkara. I've had wonderful trips on the Medina, Blanco, Guadalupe, South Llano, Pedernales, and Sabinal Rivers. 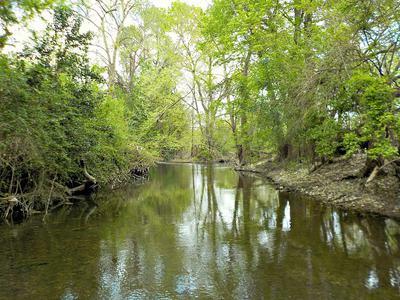 The area streams, such as Cibolo Creek, are also very productive. While I see almost no other tenkara anglers on the water, I do meet more folks now who at least know about tenkara.